Today's guest review comes from my good friend and training partner John. John is a very good engineer and has been my primary running training partner through DPT school. He is quite the Nike guy and has a ton of experience with the traditional trainers from their line. He was kind enough to share his thoughts on the Pegasus, which is by far the most frequent shoe I have seen on his feet. Based on the thousands of miles he has put in this series, here are his thoughts on the current Nike Zoom Pegasus 33. 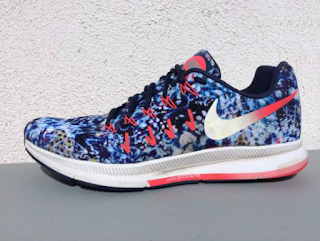 Sole/Ride: The Pegasus 33 re-writes this formula to include Zoom Air in the forefoot, and the result is a shoe that feels more mono-purpose. Anywhere you land, Zoom Air is there to absorb and redistribute forces into straight-ahead propulsion that almost feels unstable. At normal pace the shoe felt pleasantly soft and springy, more in-your-face than the previous year’s subtle and firm ride. When I picked up the pace during test runs, the ride’s squish-springiness was amplified. To the 33’s credit, the ride never felt mushy like the old Vomero 7-9, but at quick paces I didn’t feel planted. The shoe felt best when I relaxed into its Air-induced pattern instead of trying to push the pace on my far forefoot. Fit aside, the ride is completely different from the Pegasus 31/32. The forefoot Zoom Air unit is aggressively squishy, asserting itself upon first step-in with the alarming sensation that you’re stepping on something alive. 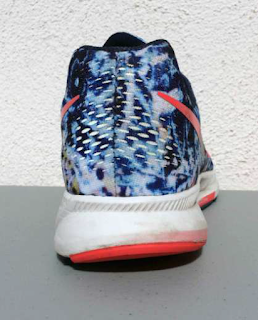 Apart from the Air units, the midsole material deforms easier than the firm Pegasus 31/32, but has a more resilient feel than the soft Pegasus 29/30. On first run, the squishy ride reminded me of the Pegasus 29/30, with an aggressive pop thanks to the forefoot air. After 3 weeks in the shoe, I’ve decided the ride is a little too monotonously bouncy for my taste. The Zoom Air unit is a “mechanical” cushion; it provides a pleasing bounce by deforming at a different rate from the surrounding EVA. 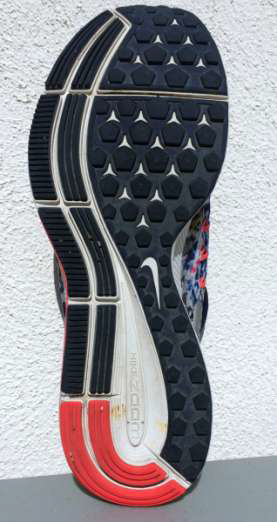 Since the Zoom Air unit is positioned parallel to the outsole of the Pegasus, it deforms differently depending on which direction force is applied. Compare this with EVA, which is ideally a “homogeneous, isotropic” material that deforms in a uniform fashion across load configurations (beyond simply the shape of the midsole). Expanding the Pegasus’s mechanical cushion into the forefoot pushed my foot into a predictable straight-ahead takeoff pattern much like Mizuno’s wave plate. That said, the Pegasus’s signature ride is a bouncy one whereas Mizuno’s is firm. The outsole features a softer blown rubber reminiscent of the 29/30. The decoupled rear-most heel pod now connects to the lateral half of the sole, where the 31/32’s connected to the medial half. After about 75 miles, I’m seeing moderate wear on the outsole material. It’s worth noting that while all of Nike’s Zoom Air trainers (Vomero, Odyssey, Structure and Elite) now feature forefoot Zoom Air, the Pegasus 33’s ride is distinct from its comrades. The Vomero 11 has a soft but resilient feel with less assertive pop than the Pegasus 33. The Structure 18’s ride (REVIEW) is unmistakably firm, posted and sealed with a distinct pop from forefoot Zoom Air. The Zoom Elite 8 is a firm, aggressive trainer that has all of its cushioning focused on the Zoom Air unit in the forefoot (whereas landing on the heel feels like landing on cardboard/concrete). 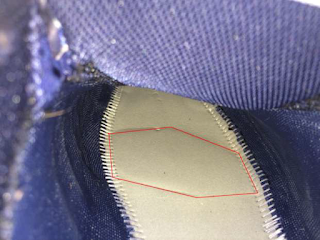 Upper/Fit: Upper construction and fit is very similar to that of the 32, that is, generous and wide through the toe-box. Bells and whistles include extra lace eyelets returning from hiatus during the 32 model year. This is important because the aggressive Zoom Air ride on the Pegasus 33 feels most stable when the shoe is wrapped tight and lace-locked to reduce slip. This comes as an interesting change as I purposely laced previous models loose to accommodate an Achilles injury. Also returning from the Pegasus 31 is excellent reflectivity that wraps from the heel counter to the lateral and medial Swooshes, and on my special Jungle color-way, the Flywire. This is the most reflective Pegasus yet. Fit is generous, so that a pain in my 3rd toe aggravated by the Pegasus 32 has been absent for the 3 weeks since switching over. A laminated overlay on the lace eyelets is identical to that on the 32. The Flywire shoelace loops reaching up from the midsole are the Nylon variety found on the 32, rather than the new flat ribbon-style ones found on the 2016 Structure, Vomero and Odyssey models. I experienced Flywire failure on the LunarTempo and Zoom Elite 6, but the Pegasus 32’s are pristine after 300+ miles. The heel counter is identical to previous models with a hard plastic cup extending halfway up, wrapped with a plush collar. 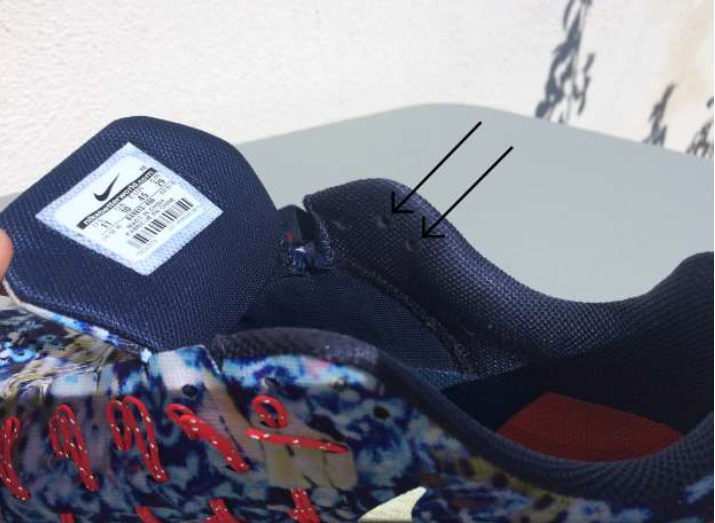 The heel counter is surprisingly forgiving, though this model seems to invite more aggressive lacing and hence a tighter heel. The weird round bulge of the Peg 32’s heel counter has been thankfully smoothed out. Thoughts as a DPT: Having done multiple gait analysis on John both throughout our time training together and while he was wearing this shoe, I know his gait fairly well. That said, there are clear differences comparing his gait, specifically during loading and propulsion phases, between the Nike Pegasus 32 and 33. 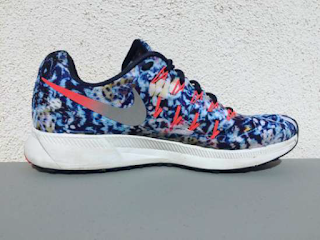 I had John run in both while taking a look at his stride and was immediately able to notice an increased amount of ground contact time during stance in the Pegasus 33. Additionally, John's propulsive/toe-off phase seemed more wobbly and when compared to the Pegasus 32 looking like he was running through mud. This was especially evident during high speed/sprint paces. This again speaks to the mechanical properties of the forefoot. 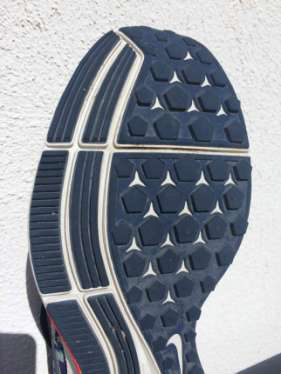 Having the pure EVA and waffle outsole of the 32 gives a very consistent and stable surface to push into during terminal stance/propulsion. The forefoot needs to be very stable during this time as it is trying to transmit forces from a contracting gastrocsolues complex (soleus initially and then gastrocnemius more as the knee straights because it is a two (some might argue three... but that's a discussion for another time) joint muscle) through the plantar fascia (and other ligaments), then through the metatarsals and finally controlled through initially eccentric then concentric activity of the long flexor tendons of the toes (flexor hallucis longus, flexor digitorum longus). This all is usually transmitted through the first and fifth metatarsal phalangeal joints, which have to be stabilized by the foot intrinsic muscles keeping the transverse metarasal arch up along with the peroneus longus stabilizing the first MTP joint and the posterior tibialis in the midfoot keeping the foot supinated to lock it out. The foot needs to be stable and resupinate during this, which locks the midfoot for a stable surface to propel off of. And that's just barely scratching the surface of ankle/foot mechanics during propulsion. The short version of this? The foot needs to be stable during toe-off/propulsion to correctly direct forces in the right direction. It's a very complex system that is easily messed with. Adding a soft Zoom Unit in this area can mess with this, particularly when the unit will throw you in whatever direction your biomechanical deficiencies may be pointing. The forefoot Zoom Air unit is very prominent in the Nike Pegasus 33 and may benefit from being reduced or firmed up to provide increased stability to the forefoot. The wide platform is fantastic, however the soft and unpredictable transfer of force causes the body to have to put more work into stabilizing the foot and ankle rather than letting forces be transmitted appropriately. The joints of the ankle and foot are very important to the body as they are the base of the entire system. Running is a high impact and high force activity. The body will defend itself against instability by sacrificing speed for protection. This occurs through all the muscles firing to stabilize rather than appropriate motor patterns kicking in to appropriately generate forces in the right direction. This can be observed very easily in new runners, who are more likely to have short and stiff strides because their bodies have not yet figured out what to do with these high forces. As the body (hopefully) develops better strength in the instrinsic muscles, the larger muscles can be used for propulsion and speed rather than being recruited to stabilize. This does not always happen and is a very complex mix of neurologic factors including motor learning, motor control and more along with strength, training and orthopedic factors. Conclusion: On the upside, I appreciate the improved upper, toe-box volume, reflectivity and additional eyelets. On the downside, the new ride is a departure from the Pegasus formula. I have standard-width feet and the fit is very comfortable. I would recommend this shoe to fans of resiliently bouncy shoes like the Brooks Ghost, Launch and Adidas Boost trainers. These shoes were a bought for full US retail price. I (Matt) put at least 75 miles on every pair of shoes before I review them (except racing flats which I put on at least 25 miles). Currently John has somewhere in the 150-200 mile range on his first pair of Pegasus 33s and hundreds (if not thousands) of miles on previous versions of the Nike Pegasus as mentioned earlier.